Have you ever heard this 1960’s song and wondered where they were going to go? Why, to Aardvark Antiques, of course. We have all the Louis! 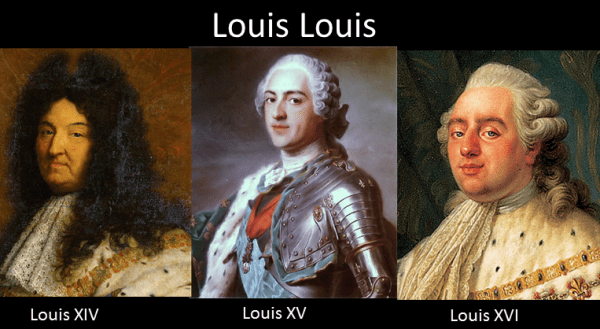 We have Louis XIV, Louis XV, and Louis XVI. Not the French monarchs but the furniture styles! Take a look for yourself. Just fabulous antique Louis XV style bombe commode chest with paw feet and white marble top. Circa 1900. In over 16 years in business, this is the only bombe chest we’ve had with paw feet. This fabulous bombe is covered in finely crafted ormolu, including cherubs on either corner. Carved floral and acanthus leaf arrangements. Rococo pulls, brass trim on apron, gorgeous parquetry over the entire case with walnut and other mixed woods. Terminating in the finest brass paw feet we have ever seen. Hand cut dovetailed drawers. Super clean and built like a tank. Pair of 19th Century Louis XV Style Patinated Bronze & Ormolu Mounted Figural Chenets. Depicting children playing. Beautiful dore bronze patina. These are just gorgeous and spectacular pieces of class. With a used, natural patina, these should last for years to come. The chairs have never been used and are from our inventory of showroom buyouts. They have only been used for display saving you over $1000. Yes, the price is actually for the pair. What a deal! These chairs are so cool! These beautiful Fauteuil chairs with all wood carved frames, lightly distressed leather seats, nail head trim accents, carved cabriole legs. Each chair measures 26″D x 27″W x 42″H. Seat height is 19″ and arm height at the lowest point is 26″. Beautiful condition. The chairs have never been used and are from our inventory of showroom buyouts. They have only been used for display saving you over $1000. Yes, the price is actually for the pair. What a deal! These chairs are so cool! You will get non-stop compliments on These beautiful Fauteuil chairs with all wood carved frames, Distressed leather seats, cowhide front back rest, carved leather padded arm rest, nail head trim accents, carved cabriole legs. Each chair measures 24″D x 26″W x 40.5″H. Seat height is 18″ and arm height at the lowest point is 25″. Beautiful never used condition. Marble topped Rococo console in hand carved mahogany. That is correct. Solid, hand carved mahogany. Carved to death, that is, with thick, heavy, mahogany, cabriolet legs with trestle base and carved pad scroll feet. Width is 45.5″ in back and 36.5″ at the front. Depth is 15″ at the center of the top and 17″ at the widest point where the legs bow out. Height is 33.25″. Antique Louis XVI French demilune side table in walnut, circa 1920. Cute as a button demilune side table that can fit anywhere. Gorgeous inlays of walnut and mixed woods, brass gallery and ormolu on front legs and feet. 3 hand cut dovetail drawers. Super clean and sturdy.